Thank you to Hypno-Mom Abby for sharing her birth story with us! I am pleased to write the birth story of Eva D’Ann, as it is one of the best experiences of my life. It was so smooth, very quick, and so special. On Thursday, I awoke to a tiny bit of bloody show beginning. I was extremely excited to see this because I had this 2 days before our first baby was born. I knew Eva would be coming soon and I was greatly looking forward to her birth and meeting our baby girl. I told Eric as he left for work, I think she’s coming soon. During the day, I felt normal. I had a bit more bloody show. My son and I had a normal day at home and I had been having extremely mild birthing waves all day. It was a beautiful day in the 70’s so we spent a lot of time outside playing. I pulled Aiden in the wagon for about an hour. I thought it might possibly speed them up and he was enjoying it. Once my husband came home from work the birthing waves slightly sped up a tad. But then once I told him, he notified the grandmothers since they were going to be on big brother duty while I had the baby. I was not happy when he said he already told them. I thought, these are so mild, I don’t even know if they will lead to the real thing and I did not want them to drive over 2 hours for no reason. So I did the same thing I did before my son was born to see if it would speed up my birthing waves (and clear my head), I took a warm shower. Then waited to see if anything happened. Around an hour later, the birthing waves were back and more intense. The only thing, they were very spread out (15 or even 20 minutes apart). So, it was my normal bed time by then. I went to bed, figured they would stop, and I would not wake up because I am a very heavy sleeper. Well, within about 1 hour, I had 2 birthing waves, and they were much more intense. After the second one, I wanted to get up and get some relief! I went to the living room and told my husband, I just had 2 birthing waves, they are very intense and I need you in here. I went straight to our tub for relief. I knew this could possibly slow things down, but I really was not concerned about that. As for my concern about the water slowing things down, the opposite happened. They started coming on so quickly. My husband had the Easy First Stage birthing hypnosis track playing for me. When the birthing waves came in, I would moan in an “Ooo” sound visualizing my cervix and saying open, open, open and I kept telling myself loose and limp. My husband, who was tracking these, at one point after I started moaning said, “You are having another!”. He had called my mom, but she wasn’t answering and his mom could not make it at that point. So, he called our neighbors and the only one who answered wasn’t in the state! He said call our daughter, she is there. After no answer, my husband went over to knock on the door and thankfully she came right over. I wasn’t looking at the time of any of this but just like I had visualized, I knew it was going quick. I knew we needed to leave fast because at the rate things were going, our daughter would be here very soon. My husband had already loaded the car and had my Hypnobabies Birthing Time track playing. I just loved the soothing sound playing. The birthing center is about 15 or so minutes and once we pulled in the parking lot, I held on to my husband as I had I think my 4th or 5th birthing wave since we left home. The midwife comes out and meets us. Another midwife who owns the birthing center, asked if it would be okay if I get checked. Everyone I ever talked to at any point of my birthing time or prenatal care had read my 3 page birthing plan I wrote, and I could tell they took it very seriously because they did everything I wanted. So they checked me, but didn’t tell me the number, just like I said in my plan. I heard the midwives whispering and the one who owns it came and said quietly, I know you said you wanted to get in the tub, but your birthing time could start very soon. You might not have time. I took this as a very good sign. The whole time I was eyeing that water. I wanted in that tub! I had a couple birthing waves on the bed then I asked if I could go to the tub for a little while. I don’t know how long I was in there, but it wasn’t long before I asked for a cool rag for my head since I was getting hot. The midwife said, let’s go ahead and you can move to the bed (I wanted to have the baby on the bed). She kept asking if I felt like pushing. I told her, I felt the baby just move down. Then as I was getting out of the water I heard a quiet popping sound. I knew my water must have broken. I walked to the bed. I thought, these birthing waves don’t seem to be getting any closer (they were already every couple minutes). She kept telling me if I felt like pushing, push. So, I decided I would and see how I felt. I had spent hours watching Ina May on YouTube and reading her book as she talked about not rushing pushing to prevent a tear. I pushed very slowly. It was about 20 or 25 minutes my husband said. They started saying, she’s going to be here soon. Then one said, we can see her head and asked if I wanted to touch it. I reached down and felt my baby’s head. I did a little happy giggle. What great motivation! After the next push or 2, my daughter was born at 2:34 am. 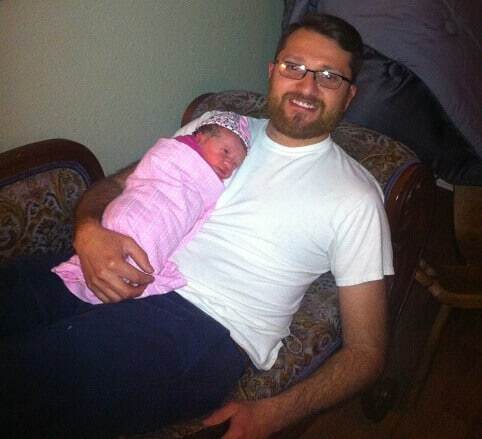 She weighed 6 pounds, 5 ounces and was 20.25 inches long. I was so happy! I said, “It feels like a dream! I think I’m going to wake up and still be pregnant!” My husband went and got us breakfast and we left the birthing center by 6:00 am. Hypnobabies gave me great hypnosis and relaxation techniques and helped me to have confidence. I knew my body was made to do this without interventions. Also, Inanna Birthing Center was so wonderful and I got the experience I had been dreaming about. 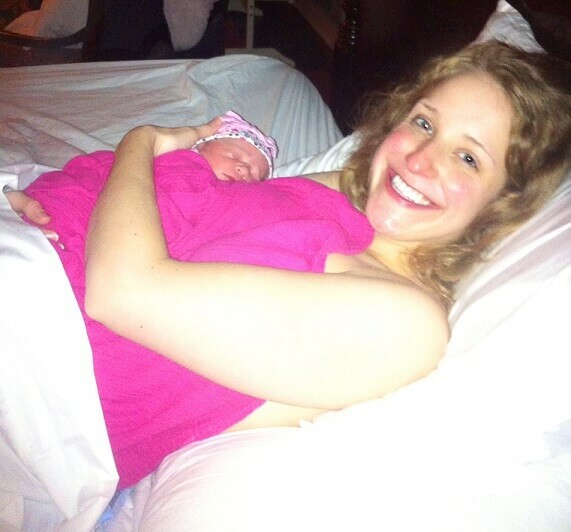 This was truly one of the best experiences of my life and we are thrilled with our precious, beautiful baby girl!